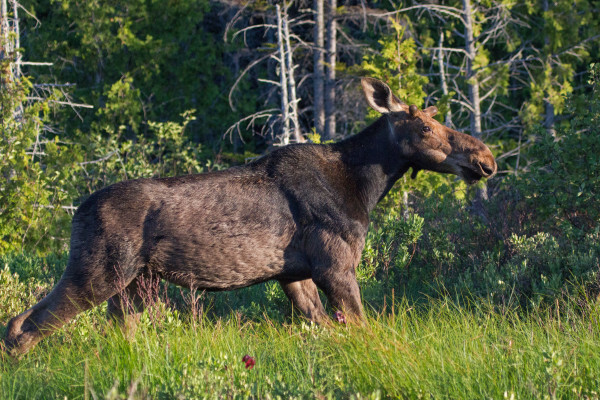 A male yearling moose walks along the shore of a pond in the Moosehead Lake Region in this June 2016 file photo. TROY, New Hampshire — Mooselick Brewing Co.’s name was a way for management to have fun and pay jesting homage to a “cool New Hampshire animal,” said co-owner Oliver Levick. He didn’t expect it would be controversial. But by late February, the small brewery and tap room on Troy’s North Main Street plans to remove the antlered animal from its name, its logo and the names of its beers. Don’t panic, local beer aficionados; the brewery will stay open, Levick said, but the company needs to re-brand. Deliberations about the new name are ongoing. The impetus for the change was a cease-and-desist letter that arrived in October from Moosehead Brewery, Levick said. The large, Canadian-based brewer has several registered U.S. trademarks, including the word “moose” in alcoholic beverages and any moose image pertaining to the alcoholic beverage industry, and ordered Mooselick to desist with its naming scheme, according to Levick. Moosehead declined to comment, and a spokeswoman for the New Brunswick-based company did not answer a question about the scope of the company’s trademark. “When you get down to brass tacks, it’s something we overlooked,” Levick said, adding that the brewery, which opened last year, hopes to turn the name change into a learning experience, in part by writing a story or blog post to advise other would-be brewers to research their chosen names to avoid a similar problem. He added that Moosehead is neither demanding money damages nor paying Mooselick to change its name. The desist order to Mooselick isn’t isolated — it has happened to other U.S. breweries — and Moosehead’s complaint isn’t always about beer. This summer, Moosehead won a high-profile lawsuit against Adirondack Pub & Brewery, a Lake George, New York, brewpub that had been selling a nonalcoholic moose-themed root beer, “Moose Wizz,” branded with a cartoon moose. As reported by Syracuse.com, Moosehead lawyers argued that brewers’ recent foray into hard sodas has blurred the distinction between alcoholic and nonalcoholic products, and that “Moose Wizz” was a trademark infringement. That argument carried the day. In September, a U.S. District Court judge ruled that Adirondack can’t sell or advertise a root beer that has the likeness of a moose or the word moose, court documents show. However, “Moose Wizz” isn’t the only product that has done battle against the Canadians — and Moosehead hasn’t always won. In 2004, Moosehead accepted a settlement with a Montana brewer, Big Sky Brewing Co., which made a beer called “Moose Drool,” the Missoula (Montana) Missoulian reported. Under the settlement, Big Sky agreed to not trademark the name “Moose Drool,” and can generally sell the beer only west of the Mississippi River. It appears Moose Drool is still sold, according to Big Sky’s website. A quick search for Moose-themed breweries or beers nets results across the United States — from Florida to Minnesota. On Nov. 28, Urban Moose Brewing Co. of Sauk Rapids, Minnesota, announced it’s changing its name to Urban Lodge Brewery and Restaurant, according to its owner, Roy Dodds. He, too, said he received a cease-and-desist letter from Moosehead, though he said it wasn’t the main reason behind the name change. He said he didn’t think the word “moose” was essential to his brand, and he wanted to add “Restaurant” to emphasize that part of the business. Though he chose not to fight Moosehead, “we probably would have had grounds to fight on” if it went to court, Dodds said. That’s because he thinks the recent judgment against Adirondack was mostly because they combined the words “moose” and “beer” in the same name, a la Moose Wizz root beer; Urban Moose didn’t do that. “What I have learned about trademark laws are, they are kind of whatever a jury decides they are. And lot of people were surprised that Moosehead won [against Adirondack],” he said. Just under two hours from Mooselick, Hop n’ Moose Brewing Co. in Rutland, Vermont, also has been contacted by Moosehead, according to an employee. The owner was not immediately available for comment. In small-town Missouri, another moose-themed brewer is agreeing to change its name, as Mooselick will. The owner of Ninja Moose Brewery in Hamilton said he’s in legal negotiations with Moosehead. The owner identified himself as “Scott” and declined to give his last name to The Sentinel, although a 2015 article in the Kansas City, Missouri-based weekly The Pitch identifies the owner as Scott Falke. The owner who spoke with The Sentinel said Moosehead contacted Ninja Moose before October, and the 2½-year-old brewery had limited options.